Fellow fans of vintage cheap toys will be happy to know that the reissuing of old Tim Mee plastic figures that's been going on over the past couple years continues to go strong with new re-releases in 2014. 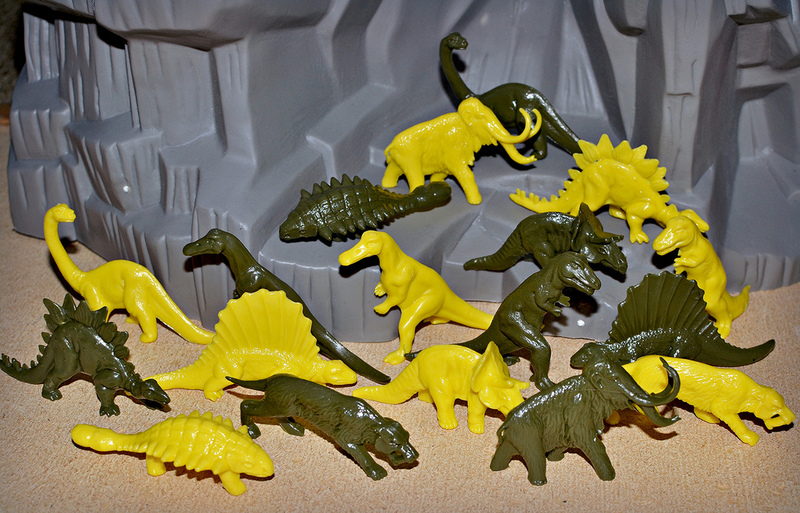 One of the most recent reissues is the classic Dinosaurs set. 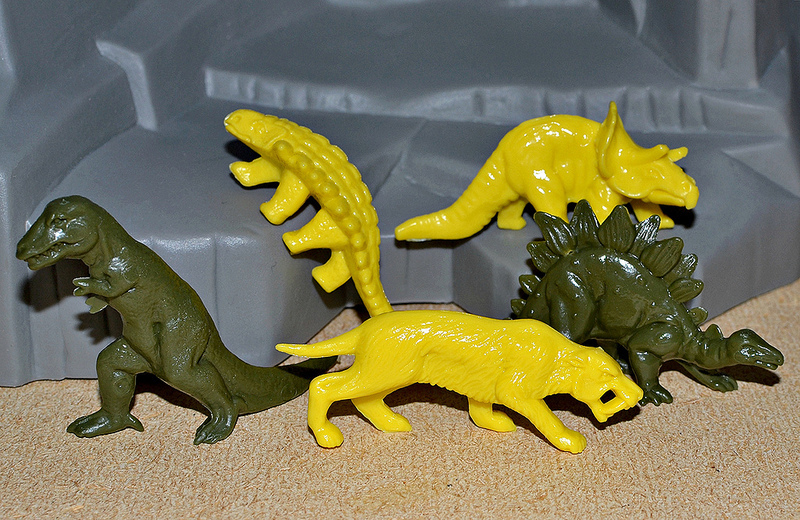 These guys were originally produced in the 1970s by Tim Mee's parent company, Processed Plastic. As with the previous Tim Mee reissues, these new versions are released by J Lloyd International Inc. and VictoryBuy, made in the USA. They come 48 pieces in a bag with a header card featuring some simple, fun, colorful art. Half of the figures in the bag are yellow and the other half are olive green. The sculpts (the longest of which measures 2.8") are nicely done with a good amount of detail, and the figures are made out of a sturdy plastic that's firm but still has a bit of give. I also like the combination of the yellow and green color--it gives them a vintage '70s feel which adds to the nostalgia factor. This, combined with the variety of creatures, makes this a really nice set of dinos! 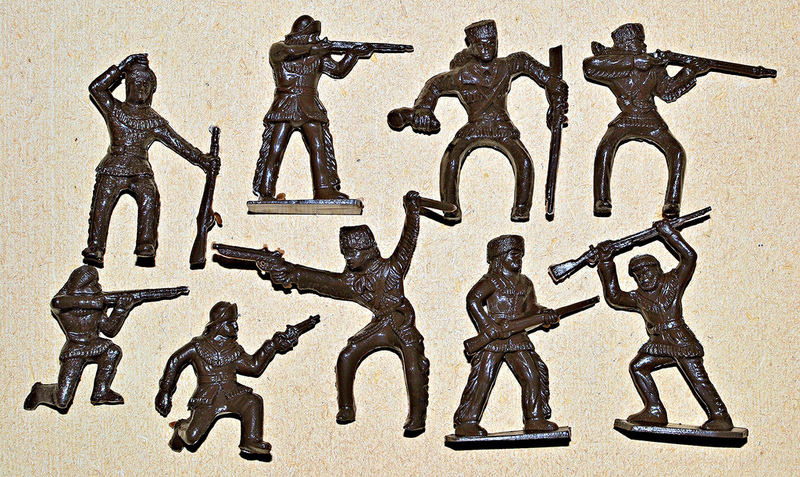 These vintage frontiersmen have been re-released in a bag of 24, including nine different sculpts all in a dark brown color. They were originally produced in 1964 by Processed Plastic, marketed as Davey Crockett and Daniel Boone toys back then. Here they're called Backwoods Battle, and as you can see from the bearded gent on the header card artwork, battlin' in the backwoods has never been so much fun. 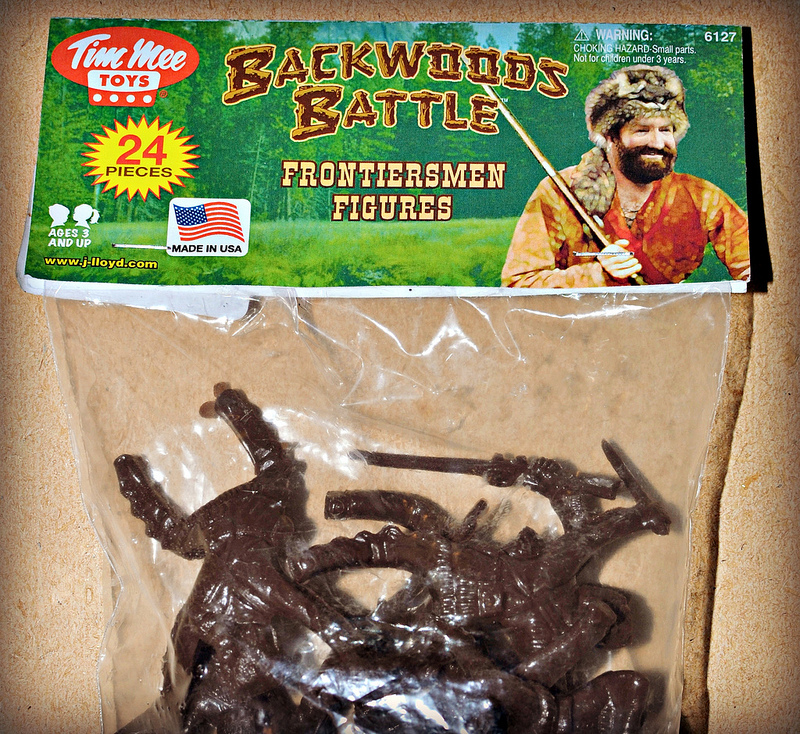 You can stage your own Backwoods Battle by picking up a bag of the frontiersmen on Amazon for $11.80. Valley of Gwangi, the playset! This reminds me, I heard of this long out-of-print German board game that would be right up your alley. If you could ever find a copy. 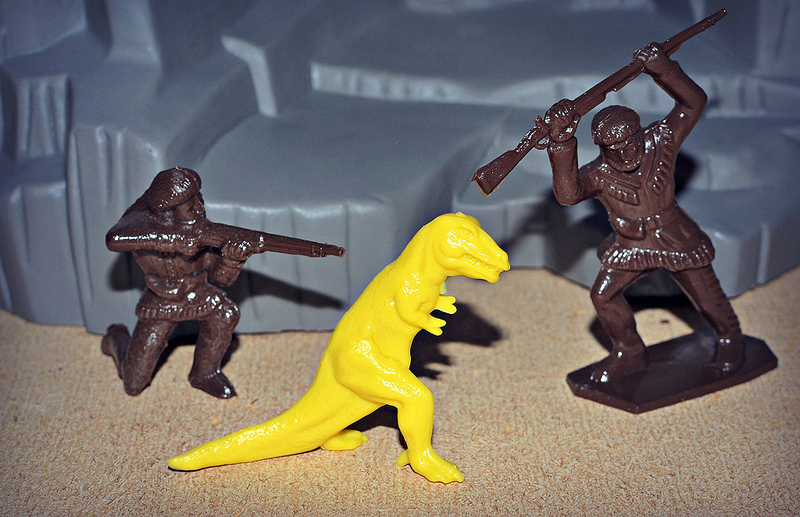 It's a plastic miniature war game with warriors mounted on dinosaurs! Thanks, I hadn't seen those before. Those game pieces are great! I love the mammoth and the Sabertooth Tiger!